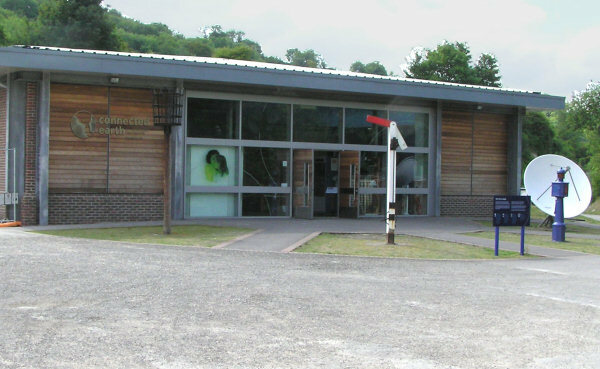 Amberley Workng Museum in Sussex has benefitted greatly from the Connected Earth project. BT partly funded a magnificent pavillion which allows a greater number of artefacts to be on display than was possible at the old BT Museum. Note that not all the items shown here are from the BT Museum. Amberley has been collecting material for many years. I visited the museum in August 2006 and took a lot of photos. Here are just a few highlights. Because many exhibits are behind Perspex and difficult to photograph, please excuse any reflections in the pictures. 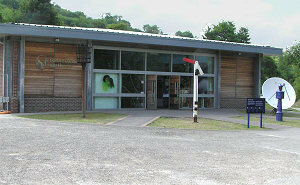 Don't forget that Amberley is a major site for displays of industrial archeology. One day is not enough to see all the different aspects of industry on display there. 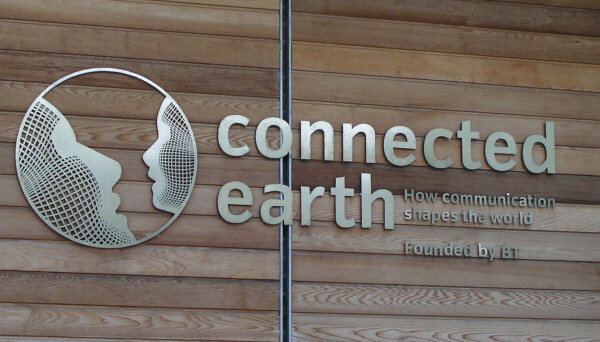 The Connected Earth Pavillion is at the far end of the site and if, like me, you're congenitally lazy, you can ride on a vintage bus from the entrance area. The fire beacon on the left and the satellite dish on the right symbolise the wide history of telecommunications. 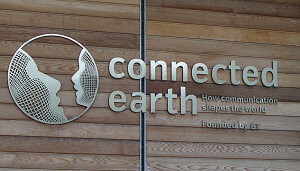 The Connected Earth logo is on display as you go in. On entering you'll see a display of vehicles along with typical street activities such as a jointer's tent and lineman up a pole. There is an excellent amount of telegraph items display. After a cabinet filled with samples from some of the many telegraph cables laid over the last 150 years you come to this cable station. Notice the tapped balance resistors all mounted on insulators and the central mirror galvanometer to read the tiny signals coming from the cable. 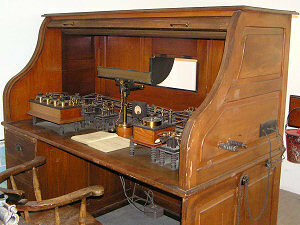 You can see the Hughes printing telegraph in its original display on my BT Museum page here [click]. I took a close up of the keyboard to show the interesting piano key layout. 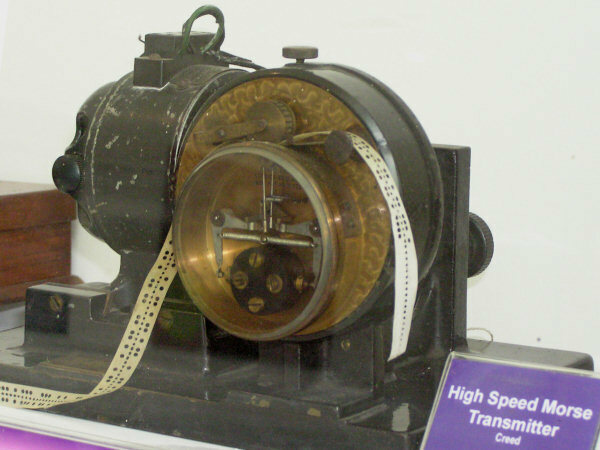 Creed are well represented by a number of machines such as this high-speed Morse transmitter. Such devices were gradually ousted by the emerging technology of the teleprinter. 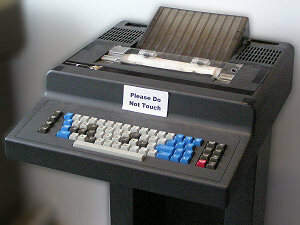 One of the last true teleprinters, but all-electronic. I used to own a similar model. When it stopped working it proved impossible to repair, being filled with custom integrated circuits. Also on display is a Cheetah screen based printer. 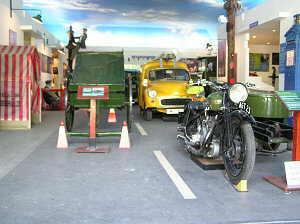 See the picture in its original home on my BT Museum page. 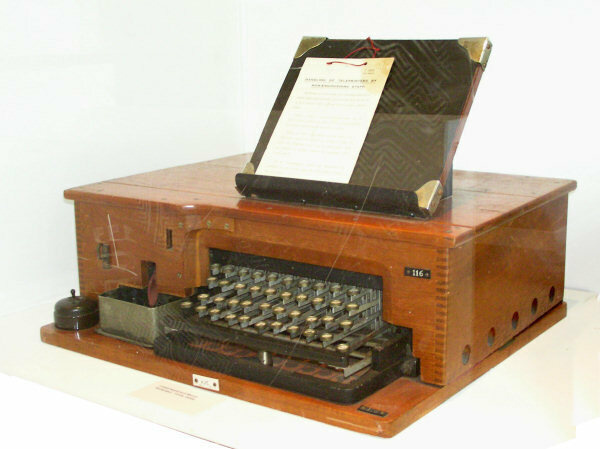 This is an early Creed Morse perforator. 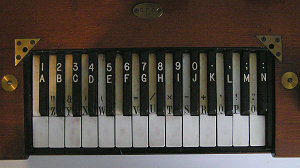 The wooden silence covers were replaced on later models by a pressed steel cover with padded sound insulation. You can see a later version of a Morse preforator in the RAF Henlow display. The next page contains some of the telephony items. Collection: Amberley Working Museum, Pictures © 2006, text © 2007 Sam Hallas.